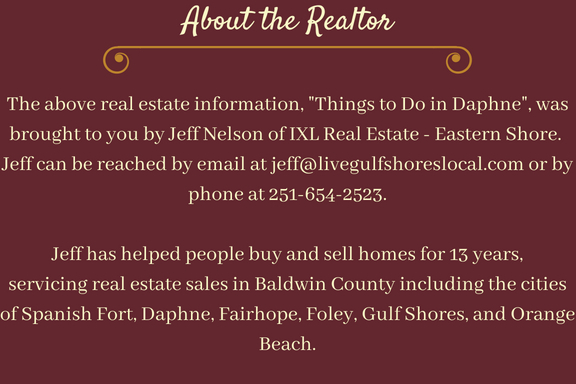 As a Realtor in Daphne I can say with full confidence that this city is exploding in growth. 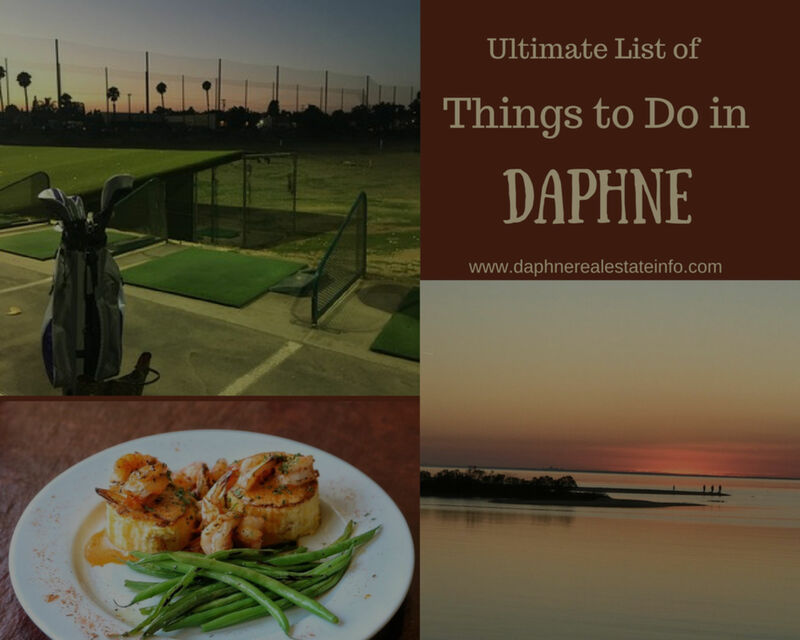 While many decide to move to Daphne for its low home prices, they soon find out that there are a ton of things to do here! Yes, you can go online and search dozens of sites but as a local guy who’s looking out for my clients, I wanted to put them all in one place. The city is growing so the list will continue to grow as well, so keep checking in to see what’s new. 1. The Al Trione Sports Complex has a number of different fields to play baseball, football, and soccer. 2. Play basketball at Park City Community Park. 3. Bike the trails at Village Point Park Preserve. 4. Play Bocce Ball (among other activities) on any of the 3 courts at Lott Park. 5. Play the 18 hole disc golf course at Daphne Central Park. 6. Launch your kayak at the Dryer Avenue Bay Access. 7. Get involved with the Daphne Parks and Rec athletic programs for kids and adults. 8. Take up Zumba Dancing at the Daphne Rec Center. 9. Seniors can take advantage of the many activities at the Daphne Senior Center that includes Bocce and Pickleball. 10. Go horseback riding at Vaughan Girls Stables. 11. Rent a bike at Infinity Bicycles. 12. Run as far as you would like on the 32 mile Eastern Shore Trail that runs through Daphne. 13. Join the best gym in town (in my opinion) – Bounds Family Branch YMCA. 14. Do the “downward dog” at CORE Studio. 15. Check out the Historic Jackson’s Oak at Village Point Park Preserve. 16. Gaze out over Mobile Bay and check out wildlife at Bayfront Park. 17. Bring your fishing pole to Mayday Park. 18. Catch a glimpse of an alligator at Gator Boardwalk. 19. Enjoy a picnic overlooking the bay at Belrose Park. 20. Get a bird’s eye view of Mobile Bay from McMillan Bluff. 21. Let Rover run around at Daphne Dog Park. 22. Watch the kids play at Centennial Park. Gazebo available. 23. Enjoy the beautiful greenery and fountain at Jubilee Courtyard. 25. Ride a pony at the Brantley Farms Petting Zoo. 26. Roam around the Jubilee Festival (end of September). 27. Dust off those roller blades and go out to the Hot Wheels Skate Center. 28. Enjoy a great wine tasting at Southern Napa Fine Wine House. 29. Take in some live music at Record Bar. 30. Sample some tapas at Le Bouchon. 31. See the latest flick at the AMC Classic Jubilee Square 12. 32. Peruse the well-stocked humidor at the Main Street Cigar Lounge. 33. A muffaletta at Yinzers Brew and Grill has your name on it. 34. Try Blackened Gator at Boudreaux’s Cajun Grill. 35. Go into cheese bliss with the fried mozzarella at Guido’s Restaurant. 36. Have breakfast or brunch at the quirky East Shore Cafe. 38. Go antiquing at the Daphne Antique Galleria. 39. Buy fresh produce at Hazel’s Market. 40. Looking for a vintage chair? Check out La La Land Boutique. 41. Read educational signage at Patriot’s Point. 42. Take in the history of sports at the American Sport Art Museum & Archives. 43. Learn a little more about the history of our town at the Daphne Museum. 44. Visit the African-American School Museum.